FDT – The Eclipse Plugin for Actionscript, Flash, Flex, MXML, HaXe, NextGen AS – IDE AS3 » FDT 4 is released!!! Monday, September 27th 2010 you will be able to buy the new FDT 4 Pure, Plus or Max. We are excited that FDT 4 is being considered the best Powerflasher release ever, and it’s thanks to you! When Powerflasher was founded in 1997 as a digital interactive agency, many flash developers were missing a professional ActionScript code editor to build cutting edge software applications. In the year 2001 we decided to start building our own IDE based on Eclipse. The developers loved it and it spread like crazy. FDT 1.0 was born! Starting in January 2010 with the release of FDT 3.5 we traveled the world to meet you at work, conferences (and of course some great parties). We openly shared the FDT 4 roadmap with you and, being big agile advocates, we made our internal iterations/sprints public free Milestones! We worked iteratively with you and we worked hard! Your contributions, constructive support, and great ideas were an integral part of the FDT 4 release and we think you’ll be pleased with the spectacular list of new features. In parallel to our milestones, we created the FDT labs, an open playground. We built the SDK to empower you to create your own plug-ins and you did: The haXe (Beta) plug-in supported by Influxis and the FDT Code Metrix Pflection plug-in from iceX33. The Dependency Visualizer and Font Creator born from the labs playground as plug-ins are now core functionality of FDT 4! We are committed in providing a cross-platform experience. We are very proud to have the opportunity to extend Linux support in our Labs with the help of the community. 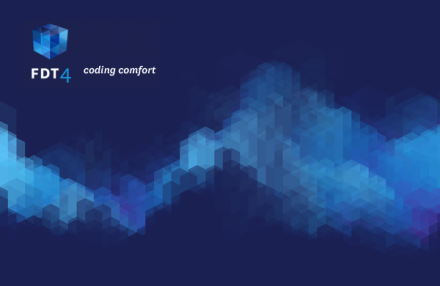 We kept the name Pure because we could not express better what the FDT Pure Coding Comfort is about. Pure great editing features enables the smooth workflow you are all raving about. FDT Professional is now called Plus. In addition to the Coding Comfort, Plus adds the navigation features to help you become more productive and work collaboratively. FDT Enterprise becomes Max. FDT Enterprise is not only for corporations, if you are either a freelancer or working in a team of power developers, performance is what you need! It’s about enabling developers to break barriers and maximize their productivity by taking advantage of state of the art IDE features power developers truly deserve. Since then we have released several upgrades, mostly for free. The last upgrade we charged was in the beginning of 2008 with the FDT 3 Enterprise release. For about tree years all upgrades were available for free, including FDT 3.5. We also decided to give all new FDT 3.5 buying customers a free FDT 4 upgrade! It’s now time to pay the bills and further invest to keep the engineering team and you happy. Now get your hands on FDT and start coding. The FDT 4 release is a result of this journey, thanks to your support and the passion of the big Powerflasher FDT family! Stephanie, Meinhard, Philipp, Sebastian, Simon, Florian, Maxim, Keisuke, Olli, Britt, Stefan(s), Timo(s), Andre, Mattes, Alan, Clement, Bruno, Michael, Nico, Robertina, Sabrina and Carlo, the Powerflasher Developer and Designer Team (aka FDT guinea pigs) and last, but not least, you!!! Bruno, I tried to enter my old 3.5 license key (purchased on 26th of January 2010), username and email to receive the new FDT 4 key, but it just recommends to buy an upgrade and does not give me a new key. The system treats me as a ver 3 customer. Should I contact sales about this? Bruno, we have purchased FDT 3.5 Enterprise on 26th January 2010. Do we have to request new license key via e-mail? Nat, should work now, let me know otherwise please. Congratulations on FDT4 release! Great product! I am trying to upgrade FDT3 Enterprise to FDT4 Max without success. When I select upgrade ($299 USD) from upgrade page (after current name + serial number + e-mail verification) browser takes me to empty page (https://) and stays there. If I try to buy full version redirect to shopping cart works properly. Are you guys going to fix that any time soon so upgrade option is available as well? On website video “Advanced Formatter” about “Profiler”. Great news! It seems though, that the Eclipse update repository isn’t up to date yet? It won’t detect any updates if you go Help > Check for updates.